The KMX Typhoon is a trike for riders who want to have a fun way to workout and get around town. By its name, you can guess what a whirlwind this trike can create with its low center of gravity and its tight turning radius. The Typhoon features an all-black stealth design that makes it more robust than many other models and brands of trikes. The Typhoon is the midrange trike in the KMX lineup. 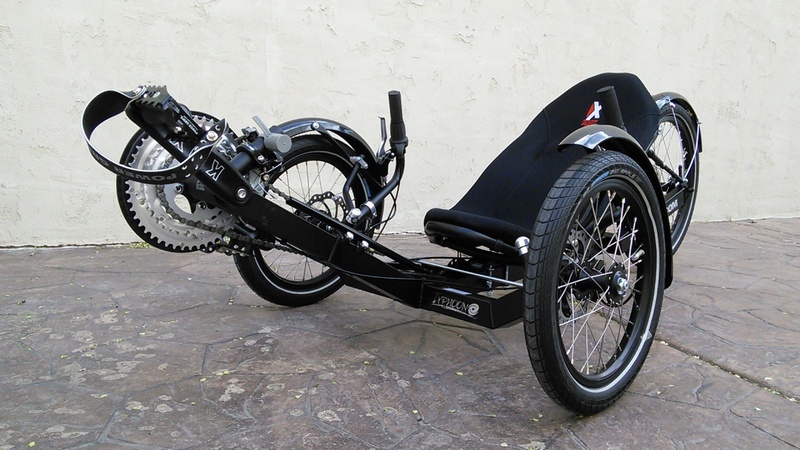 It is a step above their entry-level adult trike, the Tornado. While the Tornado is designed for teens and youth, the Typhoon is made to handle stronger and larger adult riders. The most obvious difference on the new 2009 model is the addition of KMX's new bucket seat. The original flat foam seat was the biggest criticism we ever heard about the KMX trikes, and we are glad to say that the new seat does not dissapoint. The bucket seat is a hard shell seat with foam padding that features an inter cooling vent system, which makes the seat more supportive and comfortable. The seat has several adjustable positions along the frame as well as adjustable seat stays. The main frame is TIG welded high carbon steel tubing, while the adjustable front boom is aluminum. 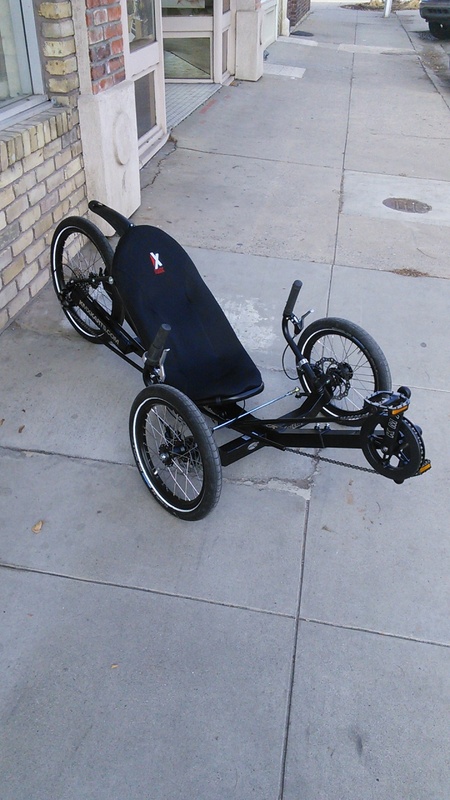 The fact that the frame is made from high carbon steel makes the trike hardy, as well as providing the trike with a high weight capacity. The improved frame angles on the 2009 model give the trike increased ground clearance, while still maintaining a low center of gravity. Considering that the trike weighs more than its lighter aluminum competitors, it makes it considerably harder to flip the trike while turning. If anyone is torn between the Tornado and the Typhoon, we think the wheels are the biggest deciding factor. The wheels on the Typhoon are Double Skinned Jetset Alloy Rims, with 32 stainless steel spokes, making them much stronger than the nylon wheels on the Tornado. 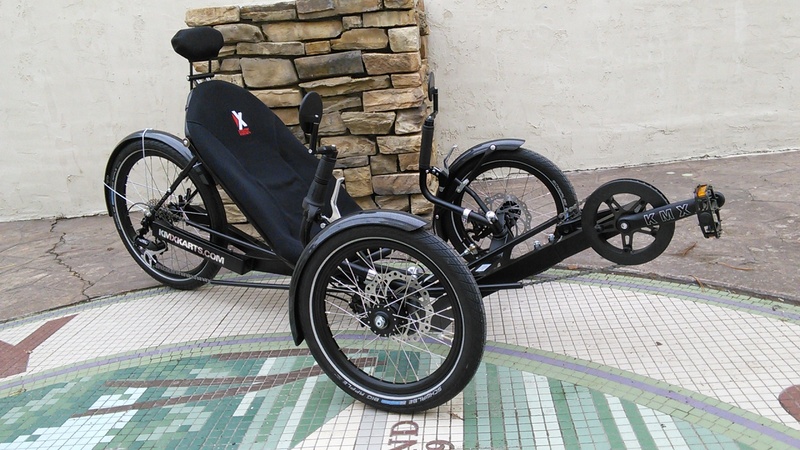 The wheels can easily support the full weight capacity (225lbs off road, 300lbs road use) of the trike. The black aluminum wheels add a stylistic element to the Typhoon with 16-inch wheels in the front and a 20-inch wheel in the rear. Most of the leading trike manufacturers are choosing Schwalbe tires as standard equipment on their trikes. Schwalbe makes the widest selection of recumbent tires with an array of rubber compounds and puncture protection capabilities. For the 2009 model, KMX has equipped the Typhoon with the Schwalbe Big Apple tires all the way around. The Big Apples are a big change from the knobbier off-road tires found on earlier versions of the trike. The Big Apples roll smoother, and give the Typhoon a fair level of suspension turning this trike into a decent every-day rider. The front boom is easily adjustable so it is extremely easy to set the right leg length. Because the frame and boom tube are square there are no worries about the frame twisting. There are index marks on the boom which makes it really easy when sharing a trike. There are handy "Min" and "Max" marks on the boom so you don't exceed the rear derailleur's capability of gathering the chain. As long as you keep within those marks you don't have to change the chain length. The front crank is a single 40T 3-piece KMX alloy crank that has a "bash ring" built in to protect the chain as well as the chainring itself. The rear cassette is a SRAM 8 speed (32-11t), which gives the Typhoon a gear inch range of 23-68. This puts your top speed at about 18MPH before spinning out. That's pretty good for smaller hills, flatter roads and bike paths. If you have a lot of hills to deal with you may want more gearing. There is no derailleur post on the Typhoon's boom so if you want more gearing the Schlumpf HSD is about your only choice. The rear gearing is managed by the SRAM 4.0 shifter and derailleur. There is good spacing between all the gears and the SRAM components work splendidly. The rear derailleur is attached to the frame by an aluminum break-away derailleur hanger. This is designed to prevent damage to the derailleur itself by providing a week link. The chainline on the Typhoon is well protected. The chain runs through the frame cross arm by means of two idlers in the front. Both idlers are sprocketed, with a plastic idler on the power side and a metal idler on the return side. While I would never recommend that as a performance setup, the idlers will last a long time. There is a third idler used on the rear power side of the chain. The return side of the chain is guided by a chain tube through the frame. The chainline is suprisingly quiet and rolls very smooth. The Typhoon features direct steering with adjustable handlebars. The steering is very responsive with a very strong tendency to go straight. This means at high speed the steering fights you some in the turns. This a good thing as it makes the handling very predictable. At lower speeds the steering is very responsive and the trike has a very tight turning radius. adjusted to match, however, it can cause you to wobble or sharply turn one way or the other. The Typhoon, like other KMX trikes, features a rear brake. Most other trike manufacturers do not have rear brakes because the rear of the trike can slide if it locks up. Using the front and rear brakes together results in extremely fast stopping. One of the exciting aspects of seperate front and rear brakes is the capability of performing stunts and tricks. Using just the front brakes can lift the rear wheel off the ground resulting in a "stoppie". If you'll be doing that a lot you may want to add the KMX Stunt Wheel. By using the right amount of rear brake in a turn you can do sliding turns and even 180s. Overall, the KMX Typhoon is a great trike with a lot of good features. The trike is very comfortable for average-sized riders with a very supportive seat. Despite the 300lb weight limit, larger riders will undoubtedly feel the seat is too small. The gear range is adequate for general riding, but may not be quite enough for hilly terrains on a regular basis. The Typhoon is a great street machine with a smooth ride and is an excellent choice for a first-time triker.